CAUTION: Materials impregnated with oil may spontaneously combust (auto-oxidation). Burn rags under supervision or dry outspread. Cold-pressed walnut oil is filtered with no additional treatment. It yellows less than linseed oil. It is closer in drying time to poppy oil than linseed, but dries faster than the former. Its viscosity is lower than that of linseed, and it can generally incorporate more pigment as a binder. The chemist Tingry noted in the mid 19th century that nut oil is more weather and UV resistant than linseed oil, despite forming a somewhat softer paint film. Walnut oil has a shorter shelf life than other oils and can spoil. 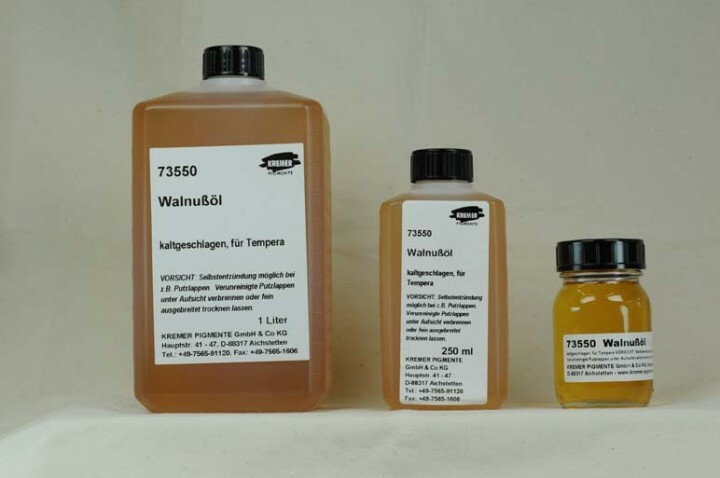 Customer evaluation for "Walnut Oil, cold-pressed"